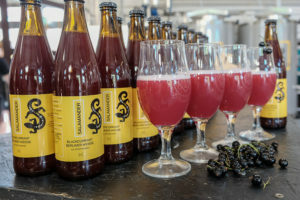 A blackcurrant beer named “SALAMANDER Blackcurrant Berliner Weisse beer”. 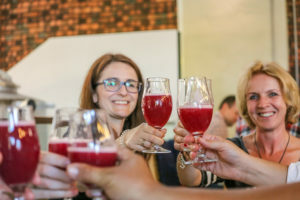 The inauguration took place in Poland in mid-July and is the outcome of a collaboration between the Polish Blackcurrant Growers Association (KSPCP) and Browar Stu Mostów brewery. The joint project brought together the competences of brewers and growers. Both enjoy a strong position: Poland is one of the leaders in the production of berries and one of the leaders of the beer revolution. The brewing market is one of the fastest growing sectors of the Polish economy. With more than 1.500 new beers launched every year in Poland, craft brewing builds the creative capital and strengthens the regional identity. For the first time in Poland, the project joins the forces of a trade organization of producers and a craft brewery. The aim is to promote the potential of collaboration between brewers and growers. The product launch ceremony was held simultaneously in Wrocław and Lublin. Wrocław is the seat of Browar Stu Mostów. The city hosts the highest number of beer projects and the most important brewing events in Poland. People also call it the “Capital of Good Beer”. Lublin is the capital of the region, responsible for 1/3 of the global production of blackcurrant. Collaboration projects and products created in Poland can have a significant effect on the popularity of blackcurrants worldwide. According to the KSPCP, the creativity of Polish brewers can significantly help growers. Browar Stu Mostów is the most international craft brewery in Poland. It was the first one in Poland to make beer together with brewers from the US, Germany and Spain. 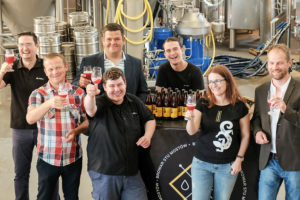 Among other brands, the brewery promotes its WRCLW Schöps beer, which is the wheat symbol of Wrocław, ART and Salamander. Beers of all three brands have won medals at the most prestigious competitions in Poland, Europe and the US. The blackcurrant beer was launched under the Salamander brand. Salamander is an old beer, which emerged at the beginning of the 19th century in Wrocław. It shows the power of meeting over a beer, friendship and respect. Up to the present day, during feasts held by German student corporations, they still cultivate and practice this custom. Product-wise, it is of course a new-wave beer. What makes the specificity of this blackcurrant beer? “In addition to the colour, the flavour and the aroma, blackcurrant also adds extra acidity. Beers of this kind are gaining popularity, with the Berliner Weisse style going through a real revival. This is a trend we should take advantage of” claims Mateusz Gulej, Chief Brewer of the Browar Stu Mostów brewery. The blackcurrant beer is a very interesting beer. It has a very low gravity, and only bright malts – Pilsner and wheat – have been used. That is what makes the beer so light. The low, almost impalpable bitterness is due to the use of the noble Tettnanger hops. 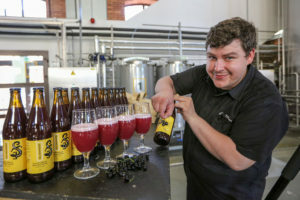 The brewers add the blackcurrants at the late stage of fermentation and aging. Blackcurrants gave the beer its characteristic flavour and aroma and emphasized its acidic profile even more. The Salamander blackcurrant beer is available at the best multitap pubs and beer stores across Poland and in the Czech Republic, Germany, Austria, Denmark, the Netherlands and Spain. The “Berliner Weisse” is a hazy, acidic, wheat style of beer with low alcohol content; a regional, historic beer from Northern Germany, particularly Berlin, where it has been brewed since the 16th century. By the end of the 19th century “Berliner Weisse” was the most popular alcoholic beverage in Berlin: 50 different breweries produced it. Today, the number has dropped to just two.